What??!! Chicken and cream cheese?! You must think I’m crazy! But I’m not. When I first tell people about one of my family’s favorite recipes they cringe a little and say “cream cheese?” and I say YES! please try it, I PROMISE you will love it. After they do they always come back and thank me. I remember a while back I was a little skeptical of cream cheese in lasagna but knew it had to be good because cream cheese Nevers fails me. After trying cream cheese lasagna I never looked back! I make this lasagna ALL the time. 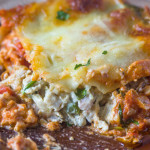 Every time I have a few cups of leftover rotisserie chicken I opt in for this lasagna because it literally gives the chicken life and turns it into a world class meal. 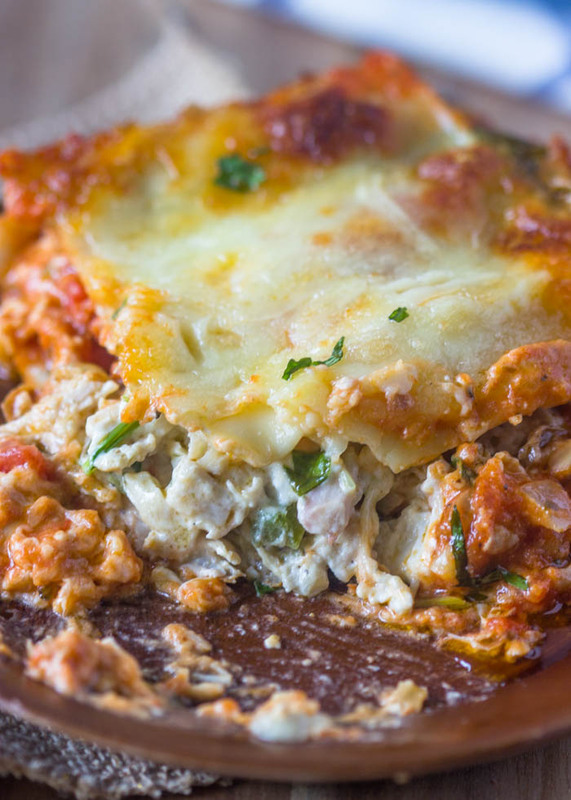 This cream cheese, chicken and spinach lasagna is insanely delicious and is definitely a keeper. <span></span>Bring a large pot of lightly salted water to a boil. 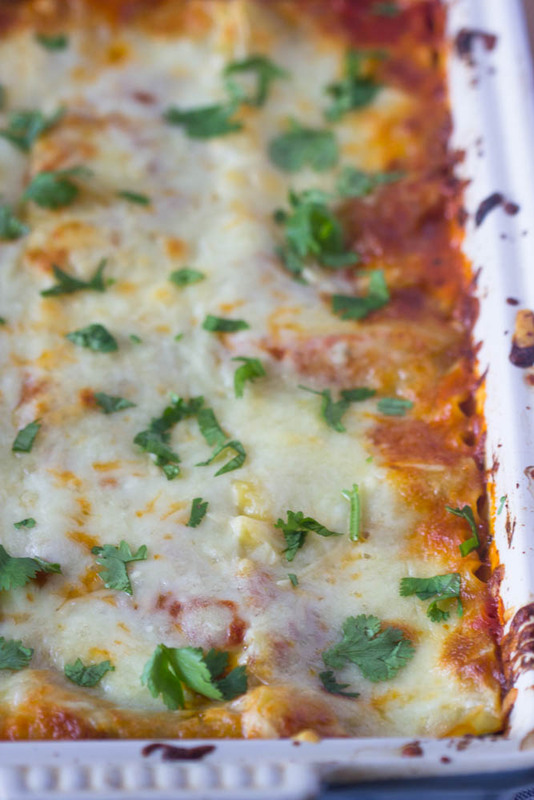 Cook lasagna noodles for 8 to 10 minutes, or until al dente. Drain, rinse with cold water, and set aside. While the pasta is cooking, heat a large pan to medium/high heat. Toss in onions and cook for 3-5 minutes, until golden and soft. Add bell peppers and cook for another minute. Next add garlic and spices and cook for just 30 seconds. Turn heat off. Add chopped spinach, cream cheese, 1 cup mozzarella, and 1/4 cup parmesan to the cooked veggies (while heat is off) and throughly combine with a spatula (you can also do this in a large bowl). Bake for 35-45 minutes or until the cheese is fully melted and the edges are brown and bubbly. I did a “white” rendition of this recipe last week and it was amazing! I made a half-recipe… but still ended up using a whole jar of alfredo sauce. I used half ricotta cheese and half mozzarella in the mixture and that worked very well. It was so good that I am making it again right now! Looks delicious but where and when do you add the jar of spaguetti sauce? it is not included in the instructions. Only in the ingredient list. What is the nutrional facts for this yummy looking receipt? Chicken and cream cheese! 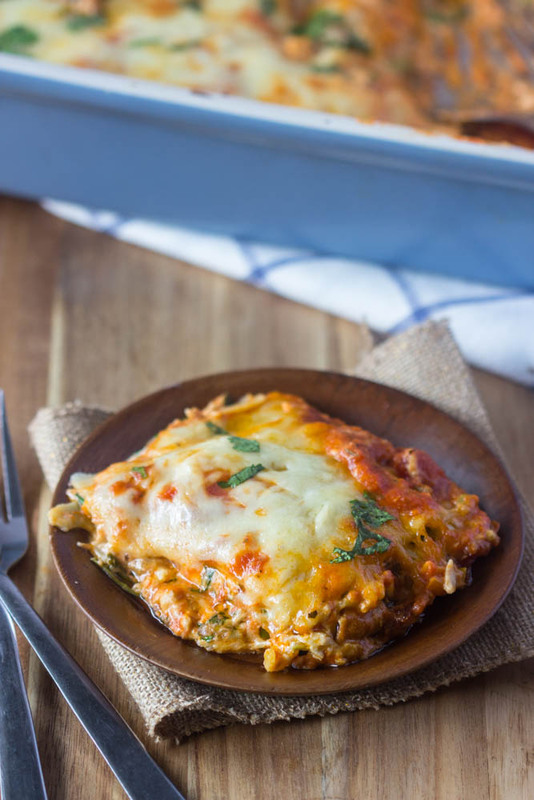 This lasagna without doubt is very yummy!